This article explains how our new ad surfing system works. It’s a quick read, please do not skip it if you want to get the most out of the system. 1) Once the time is up and you get the credit, will you continue exploring the ad, or will you move on to the next ad to earn more credits? 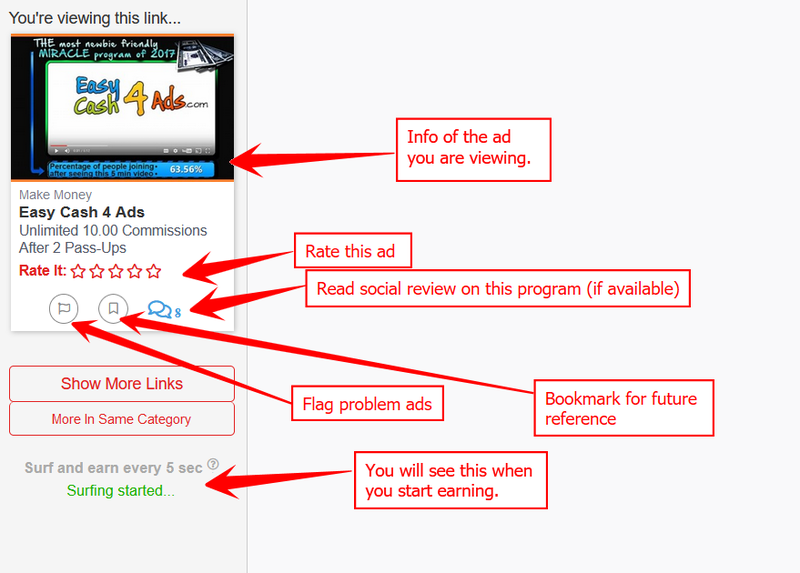 2) If you continue to explore the ad because it looks interesting, you are not compensated for your time. That is kind of unfair. 3) Some systems use a timer to tell the visitor whether the minimum viewing time has reached. That is a bad idea because visitors are more likely to keep checking the timer rather than reading the ad. I want to create a system where members are motivated to really check out an ad, click around to explore more, opt in if they like, and earn credits while doing all that. I don’t want members to be a clock watcher. They should surf freely and have confidence that they are earning credits while they surf. It took me months to think and test. Finally, I believe I’ve got it! In this new system, you will earn credits every 5 seconds for up to 3 minutes per ad. The first 5 seconds will earn you 0.2 credit. Thereafter you will earn 0.1 credit every 5 seconds for up to 3 minutes. If you find an ad interesting, just continue to read and click around. Go to the FAQ page or the About Us page if you want. As long as you stay in our proprietary ad viewer (you will know when you are), you will be credited continuously. How to know if you are credited? When you click a link, the link will open in our special ad viewer. At the top left corner, you will see info about the ad you’re viewing. You can also rate the ad, visit the original site or report the ad. After 5 seconds, you will see a message ‘Surfing in progress’ (see the 3rd arrow in the screenshot above). That is when you’ve earned your first 5 seconds of surfing. If the ad is interesting, continue to explore it further. You will continue to earn credit every 5 seconds. Please note that you must be really viewing the ad to be credited. If you go to another browser tab or multitask on your computer, you will not be credited. If the ad is boring, just close it or visit another ad. What should you take note as an advertiser? Let’s now look at how the new system works from an advertiser’s point of view. Under the new system, it is possible that you run into negative credits. This is because a visitor can be credited for up to 3 minutes. Hence if you only have 1 credit, you can run into negative credits. So don’t be surprise if you see negative credit one day. The new ad viewer also has a reporting feature. To report an ad, just click ‘Report it’ (see the second arrow in the image above). Although we review every ad in the system at the time of submission, there is still a possibility that some sites may be down or some content may be changed along the way. For such changes, we relay on you to report to us. To encourage members to report problem, members will earn 1 credit if the report is true. Please note that the credit will only be added upon verification by our admin, NOT when you report it. So if you report a problem ad, but the issue is resolved when we investigate into it, it will be considered a false alarm. In such case, no credit will be added. Another feature is ad rating (see the second arrow in the image above). It has always been my objective to help members to differentiate good ads from the rest. I have been doing that by adding features like offer icons (to differentiate free gift and content based ads from other ads) and showing total and weekly hits (so you know how popular and experienced the advertiser is). But still, I feel that they are not enough. Hence we added the ad rating system. I understand that it is hard to determine if an offer is good or bad in just a few seconds of visit. But you can easily rank the ad based on how interesting the ad is. If an ad is very interesting, rate it 5 stars. If it is a junk ad, give it 1 star. 1 star is not a compliment. It is actually a down vote. The 3-month average rating will be shown together with the ad. We show the 3-month average to make sure that the ratings are current. To encourage members to vote, members will earn 0.1 credit for rating an ad. I believe this new system is the way to go as it encourages members to explore an ad in detail, rather than chases them away for the next ad. It also leverages on the social effort to help keep up the ad standard in the network. I really like the new system. I hope you will like it too. Give it a try and let me know what you think. Great marketing strategy with the new ad system! The technology that we’ve developed in this system can be used to make into a powerful tracking system that can track how long a visitor truly stays and surfs on your site. It will be a great tool for those who advertise, as they can then track the real visitors vs clickers. Look forward to it! Hi Kenneth. Good to see you are still around. I like the new system. Hope to enjoy using it. This is great , I can finally start working on my Bucket list. (I’m a 76yr old Navy Vet and Mystic.I only have S/S to live on which dosn’ leaves me much,but now I can finally found a way that I can complete my Bucket List. Just signed up today 12/14/15. Looks great!! Really like what this system has to offer and how it’s different from the rest. I will be testing this advertising source but I am sure it will be a good one due to the method that is used for advertising to find out if the ad performs well or not. My best! Just got started and I am really excited to see how this works it really hard to find a system you really like that is EASY! Thank You For All You Do For All Of US! Really interesting concept, should absolutely make surfers take more time checking out ads much more carefully. LeadsLeap is continually making the membership more powerful and innovative for the membership…. I agree absolutely with gregory to. LeadsLeap is not a TE to click, click , click and earn Credits,i´m sure LL go the right way for me…….why, it is simple, work hard and you will earn …. I’m telling you that by clicking on it, you should have noticed the content and the program, and then clicked, and most of the stuff is also very good. It’s all about. It’s all about. What does that mean? I think it’s a Great idea! I place ads because I want real visitors..visitors who will actually take the time to look around and see what the site is about, not visitors who has no interest in my ad or site and are only clicking my ads just to gain credits. If I want to waste my time on worthless traffic like that I’ll use the traffic exchanges. We are trying to differentiate ourselves from traffic exchanges. Really glad that you don’t equate us to them. It’s quite true. Someone who does not have time to check the site correctly, I do not think it’s worth exchanging. It should be energetic and tried and time was worth it. I thought you were a good point. I love the concept…should result in more click-thrus and conversions!! Keep up the great work…thanks for all you do to make (and keep) this a great site!!! This is a very nice feature,. When an ad captures my interest, I will take the time to explore it and I don’t worry about the credits. Now, I will be getting credit when I do something that I have always done. Really great feature, now we can get quality traffic who spends time on our ads. a real challenge to other business social sites. I came across this site and I am sure glad I did. I think this site is great and gives you different ways to advertise your site. I wish you all good luck and hope you make a lot of money.I leave you link to click on and look over, Maybe it will be of some help to you. To Your Continued Success & Have A Great Day !! I really like this new feature. I am impressed with the scope of your viral marketing ideas. I am particularly attracted to the idea of free e-books as an effective viral tool. Thank you for the new concept in LL. I do not have to rush again to earn credits. Secondly, my website will be seen seriously by surfers. Keep up the good work… Cheers! Thank you for putting so much thought in this system. I do have a concern on the possibility of our credits becoming negative. Once our credit hits negative, will the free ads still be shown even it has not expired? If the negative credits grow to a huge number, I would not be really keen to play catching up by viewing ads just to make my credit positive again. I would prefer the system stop displaying my free ads once my credit hits zero. The system will stop showing your ad once the credit falls below 1, so there is some sort of buffer there. The chance of you going into negative credit is quite slim. The Internet Marketing arena has needed something like this desperately, now I hope people will take a few minutes to read this and get educated on what really works today. Great! I am happy because i find this site. I like the star rating system, the credit system is interesting, but I think it’s something we should always be improving. I’ve been a member for over 6 years but not really used LeadsLeap to full advantage. To be honest, I ignored it for years but still read your emails as they came in. I am blown away by the improvements you have made and will be sharing your fab marketing solution with all my referrals and leads. It’s truly a win-win situation! LeadsLeap has changed a lot since it was first launched back in 2008. We are now preparing for the final change before we re-launch LeadsLeap as LeadsLeap 2.0. This re-launch will let old members and the public know that LeadsLeap is no longer ‘LeadsLeap’. Very good options.Leadsleap is a great platform to grow your business. To be frank with you, I was boring clicking and looking at ads that advertised on Leadsleap(Going to be Leadsleap 2.0). There were tons of useless clicks from my end as many websites having dead links or their website no longer available. Today, I come to see what has happened after I read your regular email as usual. Tell you what was in my brain the moment I played around the new feature. I was completely shocked about the awesome improvement. The creative idea of making people want to stay longer to earn more credits to view an ad is astonishing insane. Now, the viewing is equally fair for everyone. That’s the nicest thing we can have! Final note: Please be remembered to let me be your reseller for this giant beast of traffic if you were decided to sell it to the outside through affiliate and reseller. This is because I am a Traffic Reseller for real human visitors so I know how valuable this type of traffic. I’m glad to have an expert like you who appreciate the power of the new system. We only provide the traffic to our members. No plan to sell it to non members yet. Thanks for the great information. I’m new to this and trying to learn as much as I can…it’s definitely a lot of information to digest, but I expect to do a lot of reading before I go live with my new website (that I’ve only started building today, so I haven’t gotten very far yet) I’ve taken more reading breaks than I expected. I appreciate the time you take in making this easier for everyone to learn! I have been learning a great deal about the traffic to your websites through “Leads Leap”, in fact I’ve spent most of my day getting to know it even more! It’s working out terrific! I’ve even also used a few sites listed as mailers before, so I get that I can trust the networks! Surfing to find ways to get credits is a great source in my advertising! I really hope to build my leads really quick! Especially, for this New Year 2016! This new feature would eliminate most of the need to open a site in a separate window and bookmark same.I have always been concerned that links to my advertisements about Income Opportunities might be overlooked because of viewers focusing more on gaining credits rather than taking time to review what the offers are about.Many other Advertising Sites need to take a leaf out of your book. You can still open several ads in different tabs, so that you can let them load in the background. Your surfing time only starts when you are on that page. In fact this is a good practice because you don’t have to wait for the ad to load, even though you are paid during the loading time if you are waiting on that page. Great concept! I have always felt that traditional traffic exchange methods were flawed…but I never could put my finger on the problem. But you’ve discovered a great solution from what I’m reading here. It really does seems that it would keep the surfer’s attention on the ad rather than on the timer. I know for me it would coz I;ve never been a timer watcher, but seems every time I did use a traffic exchange that darn timer always just kept glaring me right in the face forcing me to look at it, and you’re right, chasing me away to the next ad – even sometimes against my own will. Thank you. I hope you like the new system. If there is anything we can do better, let me know. I had 4 websites,but after a year of no results I stopped them,. Now I wish I kept at least one of them. This new concept of yours has overruled all other companies for any financial opportunities on the web. Thank you for restoring my confidence. I’m glad to know that! The key in long-term success is to provide values. Think along this line and your business will grow. Don’t give up! 2 questions to ask yourself. 1) How viral are your 4 websites. 2) How much values do they provide. This actually makes sense to me as a surfer. I was click click clicking my life away for credits and not necessarily doing anything effective for the business, the site, or myself. To really view an ad and see what it is was definitely missing. Pretty soon all the ads looked the same and the incentive and motivation to surf was lost. I will hopefully learn better viewing and marketing through this site. The new ideas presented may be the boost I need to continue online. I was about to give up as I could no longer see any benefit to my online activities. Don’t give up. Focus on providing values. The market will always reward those who give. I just love the system. Never seen before. I’m sure this is a great way how to give higher traffic and conversions to the advertisers and high value to the time spent by viewers. I am absolutely in! Congratulations Kenneth, this is just genius idea. This is a real cape of good hope for strugglers. Hi Everybody. I just joined today and find this a real fantastic site with genuine revenue earning potential. Well I really don’t know were to start … I just joined about a hour ago .. and I was surely thanking myself clicking that link during my surfing in another traffic exchange site. Well what can you say when you know you have found something great .. it make you think of all the great times in your life that were so perfect .. my favor being Xmas morning … . This is a great concept that will reward you in many ways for your time and interest .. you know your life will have more value from the knowledge you will gain .. I can’t comment today but promise to post more information everytime I could find interesting thoughts to share with.. This system is unique and fanastic! Very impressive the new layout of Leadsleap! Well I really don’t know were to start, I just joined about a hour ago and I was surely thanking myself clicking that link another traffic exchange site that makes you Earn !!. Well what will you say when you know you have found something that looks great ? it make you think of all the great times in your life that were so dream and you I think this looks great ! Some great ideas and forward-thinking. Thanks for continuing to improve LeadsLeap! Hi Everyone, Just joined this evening.This looks AWESOME! Will take a bit of time to learn the ins and outs.This is a huge positive step up for me. The best to all! I’ve look high and low to find a legit way to earn sign up. Hope this is it looking forward to learning how to use it to get the most out of it. Do I earn any money and income from the spillover effect? No. Our commissions is single level. We are not an MLM company. Ayisha, welcome to LeadsLeap. Read the articles and info in your Member’s area and ask specific question so that we know how to help you. I just joined today, so I’m still trying to get my head around how you do things here..lots to read and explore, though I think I understand the basic concept. Have to say I find the quality of the site “text” refreshing..it’s nice to encounter something that comes across as honest and not based totally in hype and BS..and this gives me high hopes for this service and the results that are possible from using the same..hence my joining. Best of luck to everyone reading this. It’s great being part of this awesome opportunity, truly it pays earning money online while doing nothing. See you all at the TOP!!! Super new look and amazing instructions! I look forward to using you more now! Sounds great, I hope this will be a win win for everybody. Good system! We all need the traffic and the feedback. What a refreshing departure from the boring PTC sites. Good for both members and advertisers, more for advertisers who are more likely to continue sponsorship. That can only mean longevity for LeadsLeap. This Interesting. I Will take time to learn and earn money. Thanks Leadsleap. I signed up about an hour ago and since then I’m investigating how Leadsleap works. Thanks for building it for all of us. The new ad system is a great tool for marketing. I am exploring it for the first time. I want to master it so I can maximize my time and profit as well. Thanks for the new system and the opportunity to build up my downlines. I hope this will compliment my advertising arsenal! Wow.. sure sounds like a very good system you’ve got going here now. I’ve been a member since god knows when.. hahaha.. Somehow, this just slipped down the line. Until a few weeks back when I came upon an email (I think) about LeadsLeap once again. Decided to check things out.. my my.. think I will spend a bit more time in here every day to check things out.. and try them out one at a time.. This is a program I have been looking for a long long time. I ‘m not going to waste my time anymore I’ll stick to Leads Leap forever. Thank you! I have understand so fast! Great site ! I haven’t seen such a helpful, innovative and interactive advertising site on the net such as this..Love it! Nice system I am a new comer this is my first day but I’m am excited to have this opportunity. Thanks! And look forward to great reports here in the near future. Love advertising and advertisers. Am trying to grasp the best way to make your system work to earn money and promote art. Good, a system like this that I’ve been waiting for … Finally, there is someone who understands and make changes like this. Thumbs Up. Brand new here. So far I like the idea. I am new to the system so far so good. Hi, As a new member, This is exciting news ! ! ! Traffic Plus Income. what a unique idea. I look forward to comparing the income from my site with the monthly cost of time and expense here at leadsleap. I will be be blogging if it shows a high ratio next month. Keep tuned. Read on members. This site is so plugged in to the win-win and an even brighter future! I like this, you can never get time back so using our time is this manner is effective and efficient! The changes make sense to me. I think they will encourage advertising. I could see the greatness on the new features! I couldn’t be happier with LeadsLeap. Followed it as a free member for quite awhile and recently upgraded and am using the widgets, Pro ads, and even surfing. The Surfing/Credit setup is about as Fair as it can get. Even better, I am now experiencing new members joining under me. Happy, happy! I just joined but from what I have read so far I am looking forward to a profitable and enjoyable long term relationship that will be mutually beneficial. I think that you have clearly explained how the new ad surfing system works. Thanks a lot for updating us on the new development. Keep us updated in the future. I THINK THIS PROGRAM IS GREAT ! I’M PRETTY MUCH A NEWBIE MEANING I’VE BEEN RIPPED OFF BEFORE AND NOW WITH THE, LL2.0 I KNOW I CAN EARN AND LEARN AVOIDING THE GURUS. THANKS TO THE LL2.0 TEAM THAT DEVELOPED IT, AND MADE IT EVEN BETTER ! YOU GUYS AND GALS ARE JUST GREAT ! A CUT-ABOVE ALL THE REST. NEEDLESS TO SAY I JOIN AND THE SAME DAY I WENT TO PRO. AND I KNOW THIS IS THE GOOSE WHO LAYS GOLDEN EGGS ! ONLY SUGGESTIONS I HAVE IS TO KEEP WORKING HARD SO THE GOOSE WILL LAY PLATINUM EGGS ! MY SUCCESS WILL BE DUE TO YOUR HARD WORK AND DEDICATION. THANK YOU ! I think this programme is amazing.I just want to say Thank you. So nice to be able to relax and learn. Just wildly clicking for credits is stressful! I’m very thankful for finding this program. Very interesting and good improvemeny. credit for visitors and advantage for advertiser. Win Win Situation. That is possible. I wonder how many members will be keen on such a system. Wow, I think this is a great suggestion. It really represents the ultimate purpose of what an advertiser seeks in his ads: to have a person opt-in to their offer. Kenneth, I hope you can incorporate something like this in your excellent system. It is a really a very good concept , although I only started with this site a 1hr ago so I will then see how it works. This is truly a concept that means well for both web-owner and members alike, good work keep it up. ust Started and Learning as Much as I Can. I Do Like What I Am Seeing So Far. Leadsleap is amazing. Unique ideas.Thank you so much for your work. I have never seen anything like this, I think it will work Great and help all the advertisers and help the beginners learn more… Thank you..
i was missing a lot since I joined & never returned back. Hi, I had joined several years ago & ran into the site again today. I have been reading & like so many others, I am very impressed! Very good strategy. I have just started and like what I see so far! I begin with the system, I read your explanations that encourage me to persevere with you. Only started now will comment in a couple of days. I just joined today too! This is a big opportunity to earn credit while surfing ad. Thank you so much for sharing this information. I have seen so many traffic exchange site up to now but LEADSLEAP is amazingly different. Undoubtedly leadsleap is a newbie-friendly platform where one can not even learn a lot but earn too.you’ve got my approval! Looks like a winner, I am awaiting the opportunity to share this with others. Easy earning system from leadsleap. Just signed up. Hoping it will provide leads to my site. Amazing thoughts! Loved this features. great traffic and exchange website. thanks a lot. I’m a newcomer here and I already see the huge difference from other so called traffic sites. yours is totally pro. I just wonder if there’s any possible way to contact and chat with other members. Thanks. We do not enable member to member direct communication. We used to have a private message feature, but it ended up being a spam junk. Hence we removed that feature completely. To reach out to other members, the best way is via LeadsLeap Ads and Social Review. To reach out to your downlines, use Downline Message. These methods are not obtrusive and allows you to reach out to them effectively and repeatedly. Excellent feature! A good check and balance system to ensure quality ads at the same time giving incentives to users. Very logical way to surf and earn on the basis of staying on the ad rather going through it without even realizing what it is and what it is for. LeadsLeap is a much better traffic generation system compared to traditional traffic exchanges. Here people truly see your offer and do not click away after 15 seconds. Also, I think this provides a lot of targeted traffic, people who are truly interested in the offer. I have read many great reviews about LeadsLeap, this is why I signed up. Hey i have joined some months ago without taking it seriously. But coming back today and after reading this review I’ m fully convinced that this the right place of the job I was looking for to promote my business. Good Morning, even though I am new here, & I’m finally able to sit down & read more about LeadsLeap & what its all about & the concept of it & everything. I do have to say that I really like it & it’s useful & great & I am looking forward into seeing what comes of it. Also just out of curiosity, while on this page it says that it’s not a secure site. So do you think you could look into that. Over all I think its great. Thanks & have a great & awesome day. This is truly a concept that means well for both web-owner and members alike, good work keeps it up. I just signed up. And have a lot of shortcomings in English and also in computer science. Getting to put my site in English would not be easy. Really I find that Leadsleap really interesting. But I hope for the sequel The Almighty God will help me with your support. Thank you very much Kennet. 1.- Really Love your site!!. Initially joined Last year & it Catches my attention and almost immediately. I’ve posted your PPC-Widget in my website. 2.- I got distracted for some time till I got back this February to LeadsLeap. 3.- Started reviewing other Features of your Great Site, I posted several other ADS & Started seeing a good response to my ads. 4.- Reviewed little more other features of your site & proceed to Implement some more, after that. 6.- NOW I Have Posted PRO Ads has Pro Member & am Surprised of Great Amount of Traffic My Pro ads Are Getting. 7.- To the Point where Am Going to Quit A Couple of My TRAFFIC EXCHANGE Sites & Put My Money At LeadsLeap, where I Do Get Response to my Efforts. 8.- To Focus More on LeadsLeap & Continue to Take Full Benefit of All the GREAT FEATURES that LEADSLEAP Offers. 9.- I have purchased Several Great Advertised Programs Here at LEADSLEAP that Looks Very Effective. 10.- In All my Years over 10 Surfing on the Web HAVE NOT FOUND a Site Like LEADSLEAP that has such a Large amount of Great Programs being offered. 11.- Only thing I Will really Miss from Other Traffic Exchanges & would really love to see here in LEADSLEAP is an option In SIDEBAR Of ADS for MAILING to myself The Really Interesting Sites Being Offered to Review Further, before signing up to them. 12.-If You are In Need of Great RESOURCES, TRAINING In Multiple areas of Marketing Advertising & INCREASED Amount of TRAFFIC You Must Join LEADS LEAP.